Joining a legacy of notable chefs from across the Southeast and East Coast, Executive Chef Wesley Fulmer of Motor Supply Co. Bistro in Columbia, South Carolina, has been chosen to serve as one of two S.C. guest chefs at the grand finale “Sunday Supper” event at the 11th annual Euphoria Greenville Food Festival in Greenville, S.C., on Sept. 24, 2017. Fresh from another “Best Restaurant” win (via the Free Times’ Best of Columbia readers’ poll), Fulmer will collaborate with celebrated Chef Michelle Weaver of Charleston Grill in Charleston, S.C., along with several culinary stars from Greenville’s Table 301 Restaurant Group. The highly esteemed Sunday Supper experience serves as a splendid end to a weekend full of fine food, drinks and music at Euphoria Greenville, known nationwide as one of the Southeast’s most popular food and drink festivals. 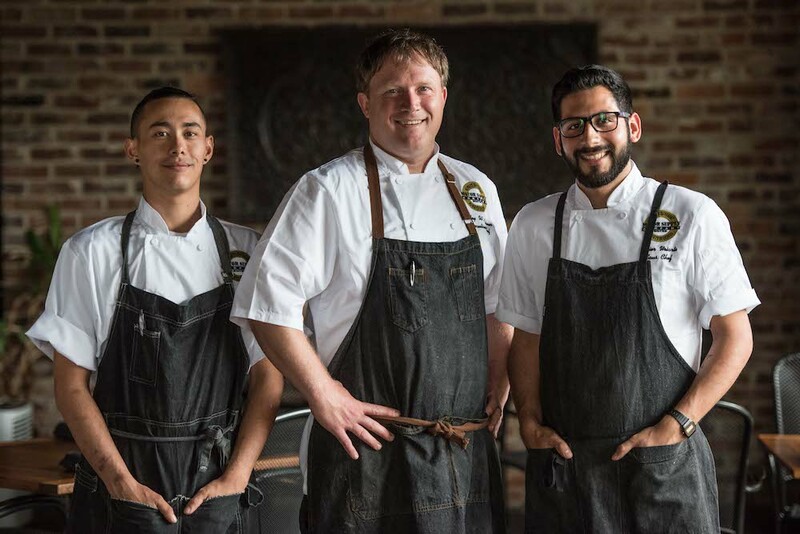 Guests will break bread with an elite lineup of chefs while overlooking the Reedy River, sharing a family-style meal that highlights locally grown ingredients. The event will take place at the Wyche Pavilion on South Main Street in downtown Greenville, South Carolina. Past guest chefs have included Chef Thomas Raquel of Le Bernardin in New York; Chef Curtis Duffy of Grace in Chicago; Chef Chris Hastings of Hot and Hot Fish Club in Birmingham, Alabama; Nico Romo of NICO (former chef of Fish Restaurant) in Charleston, S.C.; Anthony Gray of Bacon Bros. Public House in Greenville, S.C.; Lindsay Beck of Soby’s New South Cuisine in Greenville, S.C.; and Chef Mike Davis of Terra in Columbia, S.C.
Motor Supply’s acclaimed head barman, Josh Streetman, is also making appearances at Euphoria Greenville, after winning the Free Times' "Best Bartender" and garnering the only award placement in the Carolinas at this year's Tales of the Cocktail competition. During the “VIP Experience: Eat, Sip, Listen” event on Sept. 22, Streetman joins local Greenville mixologist Walker Pickering of Nose Dive to create two signature cocktails for the evening. Additionally, Euphoria attendees can find Streetman at the keystone “Feast by the Field” event for a mixologist demo on Sept. 23. Each year, the highly anticipated four-day Euphoria Greenville festival attracts food, drink and music lovers as well as food writers and editors from across the country while shining a spotlight on Greenville, South Carolina’s thriving culinary and arts communities. Proceeds from Euphoria Greenville will fund Local Boys Do Good, a 501 (c)(3) organization created to benefit local nonprofits. Visit http://www.euphoriagreenville.com/events/ to view the full schedule of events and to purchase tickets. A prime mover in the progressive upscale dining scene in Columbia, S.C., Motor Supply works with sustainable, local farms and is known for its excellent wines, artisan cocktails, casual atmosphere and daily-changing, chef-driven menu. Motor Supply Co. Bistro has been serving New World, made-from-scratch cuisine in the historic Congaree Vista district since 1989. A new, temperature-controlled outdoor patio features tables made from reclaimed, North Carolina barn wood, roll-up garage doors and original, vintage brick. Reservations can be made by calling (803) 256-6687 or by visiting www.motorsupplycobistro.com.